1 Point equivalent to 1 cent and points become redeemable when you have accrued 500 points (minimum $5). You will be rewarded 2% of the total value of the product total. Points that have already been credited under your registered user name can be used at checkout. Points accumulated from a completed purchase will take approximately 2 days to be added to your account. 500-3000 points can be redeemed per purchase. When a maximum of 3000 is redeemed, the remaining points will be credited back to your account. 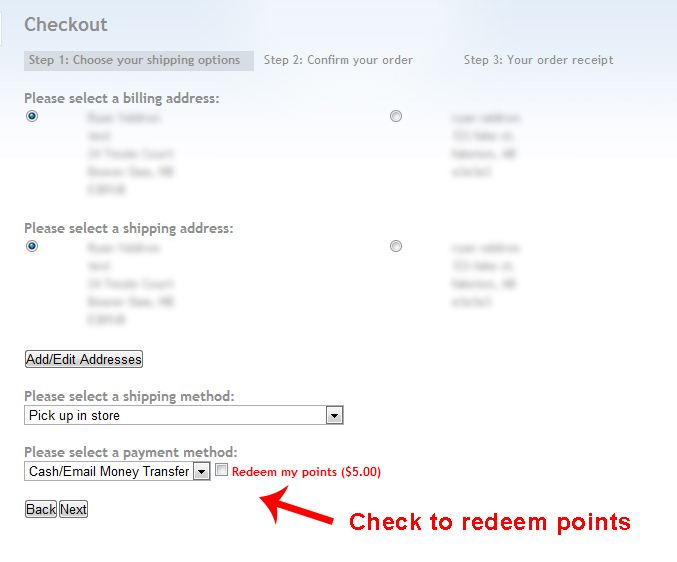 In order to redeem points, check the "redeem points" check box beside the payment method on the checkout screen (see image below). The points value will automatically be deducted from the after tax order total on the next screen. Your points accumulated from purchases from Derek's Reef Shop are valid for 1 year from the date of your last purchase. Please be warned that if there is no activity from your account for 1 year from the date of your last purchase, your points will be void and can not be used. Log into your account on the site, it'll display on the first line right after your name. Points are non transferable nor can be traded in for cash value.